Want a Healthy Smile? A Dentist Says to Avoid These 5 Habits! If you’re brushing and flossing regularly, you have nothing to worry about when it comes to your oral health, right? Unfortunately, it’s not so simple! While good hygiene habits and seeing a dentist regularly are certainly the foundation of a healthy smile, there are also certain things you should avoid doing if you want your smile to stay healthy. Keep reading to learn about five of the most common habits to avoid to help you stay out of the dental chair and hang on to your healthy smile for life! There are two main types of clenching and grinding: nighttime and daytime. While there’s not much you can do to prevent clenching and grinding at night, you can protect your teeth by wearing a night guard! For daytime clenching and grinding, simply being self-aware is helpful. For example, if you find that being in traffic is a trigger for you, do some deep breathing and focus on keeping your jaws in a relaxed position. With practice, it will become more second nature! 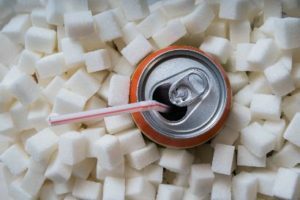 “Sip all day, get decay.” – Keep this handy saying in mind to help you remember to consume anything sugary in one sitting instead of grazing on it throughout the day. The more frequently you expose your teeth to sugar, the more likely you are to develop cavities! Rinse or chew sugar-free gum after snacks – Brushing and flossing isn’t always possible, so it’s a good idea to swish with water several times after snacks. You can also chew sugar-free gum to stimulate salivary flow, which washes away food debris and neutralizes sugars and acids that contribute to cavities. Minimize sticky, sweet foods – Minimize foods like gummy candies, dried fruit, or sticky sweets such as caramel, as they can greatly increase your risk for decay! Opening packages or bottles with your teeth is very risky, as you can easily break a tooth or chip dental work. Get in the habit of using the right tools to open containers and your teeth will thank you for it! This is a common example of a daily habit that many people don’t think about! Oftentimes, people chew on ice to relieve stress or help them concentrate, but unfortunately, it can cause your teeth or dental work to chip. The trick is to find a substitute such as chewing sugar-free gum or snacking on crunchy foods like celery or carrots. It seems counter-intuitive, but brushing hard doesn’t actually get your teeth cleaner. But it does potentially damage your gum tissue and wear away at your enamel over time. It may take a few weeks, but if you start to consciously brush with less pressure, it will become a habit. You can also use an electric brush, which automatically uses less pressure! No one likes being in the dental chair. By avoiding these five habits, you can minimize your chances of spending much time there! Dr. Neil Flenniken does more than provide great dental care for his patients. He also teaches them how to take great care of their teeth in between their dental visits so they can prevent the need for extensive dental work as much as possible. If you have any questions, he can be contacted via his website or at (717) 249-7777. Comments Off on Want a Healthy Smile? A Dentist Says to Avoid These 5 Habits!